With the onset of warmer spring and summer weather, one task that I always perform is a check up and cleaning of my home’s windows. This cleaning removes the winter’s accumulation of dust and dirt that has found its way to my screens and impairs my view. I also check my wood window frames for moisture or painting issues. If you have vinyl or metal clad exteriors, this step may not be necessary. Now that the weather is warm enough to open windows, the spring cleanup can commence. Here’s how I do it. The exterior of wood frame windows will generally need a coat of latex paint every 3-5 years. This schedule may vary by which direction the window faces, and the harshness of your local climate. Prevailing winds and rain and excessive sun can lead to earlier paint failures. Checking your windows on a regular schedule can allow you to make the needed repairs before your wood gets exposed to the elements. 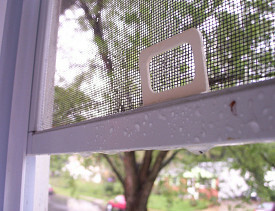 Good luck with your spring window maintenance, and remember that prevention is the best medicine. Kevin Stevens is a Hometalk.com writer. Read more articles like this one or get help with your home projects on Hometalk.com.